I expected to enjoy it, I did. 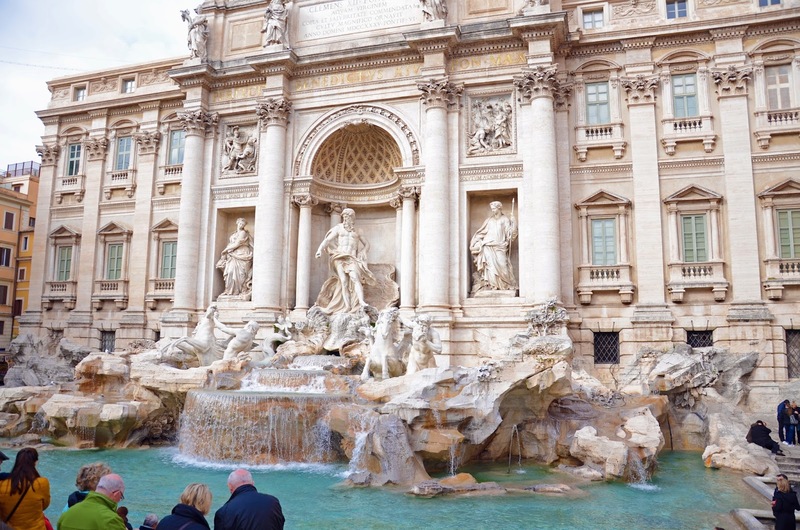 I expected adventure and the absolute sweet joy of everyday life there - La Dolce Vita. But I never anticipated to fall so wholeheartedly in love with this mysterious and magical place I had heard about all of my life. This place I thought I'd never get to, at least not anymore. But there I was, in London, boarding the plane with my brother and MILAN was flashing up on the screen. This is real. This IS IT. Since I have been back, everyone asks me what my favorite place to go was. And I honestly don't have an answer. Every place I stepped foot on was my favorite for a different reason. 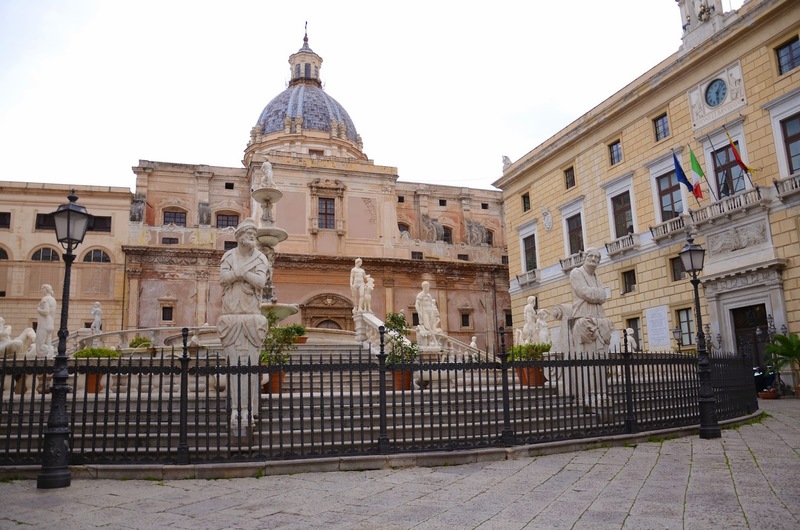 Some places, like Palermo, Sicily and Rome are beautiful because of the architectural aspect. Things built by the hands of men. 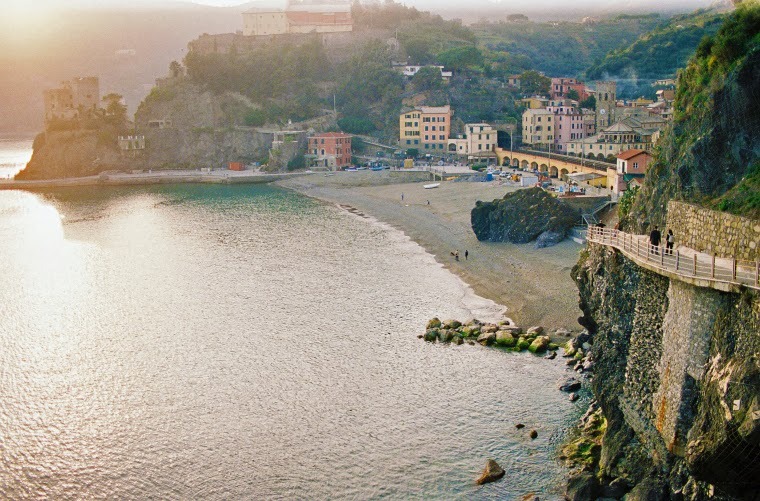 Places such as Peschici and the Amalfi Coast are gorgeous because our creator made them so. Some places were filled with history and art ... others, with friendly faces and serene landscapes. And every place, and I mean every square inch of that place was filled with a passion for life that I have rarely experienced in such a huge capacity. As I expected, there are no adequate words to describe this Italy, the place that has just changed the way I view life in such a momentousness way, but because 'we write to taste life twice', I will try to do so here. On the 100th Anniversary of my great grandparents - Samuel Molise` & Giroloma Di`Piazza - coming over to America, my brother and I decided to plan a rather ambitious trip to not only see with our own eyes where our family is from, but to melt into the culture there learning who they were and what they loved. 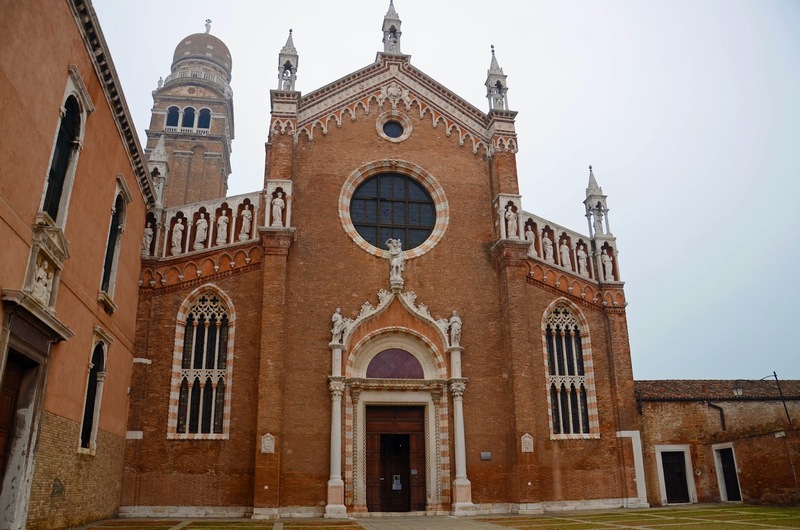 It was a 14 day trip, starting in Milan, driving across northern Italy beside the Dolomite Mountains across to Venice. 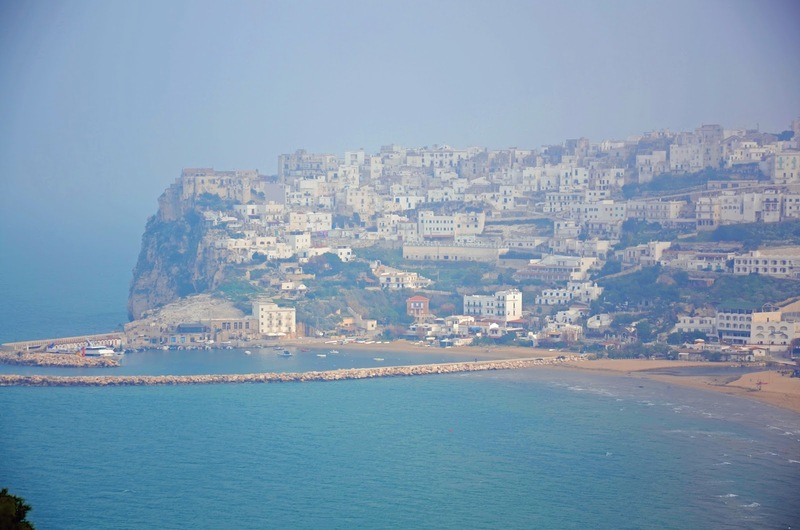 Then driving down the east coast of Italy to a little village called Peschici, and down through southern Italy to Calabria where we caught a ferry to the island of Sicily. 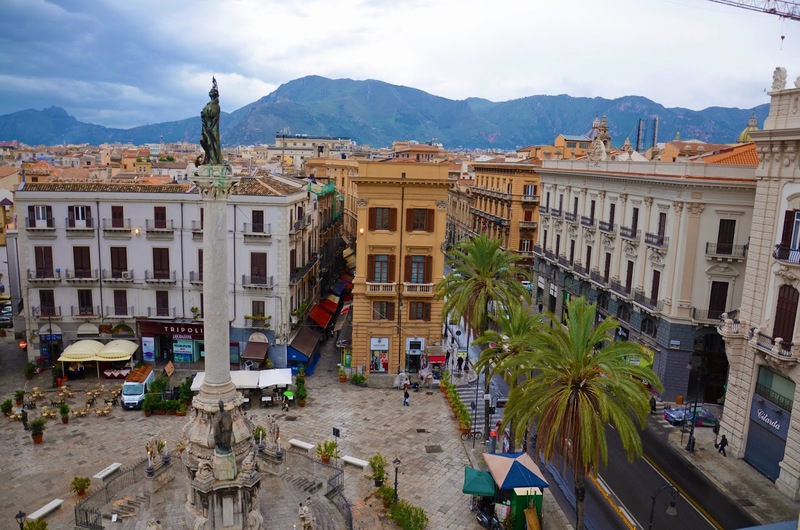 Once in Sicily we drove across to Palermo, staying for several days and then headed back to Calabria to venture north on the west coast of Italy. On that trek, we hit Paestum, Herculaneum, Pompeii, and Naples. Following up with San Pietro, Rome, Florence, Pisa, and back to Milan to finish our trip. Most people were always so engaged with the people around them and what was going on at that given moment. In other words, when they were there, they were ALL there. Every conversation whether it be on a cobblestone road, during a meal, or at a soccer match was filled with laughing and hugging and lots of hand gestures. (gotta love the talking with hands). Never once did I see someone sitting across from friends or family looking down at, or talking on, a cell phone. 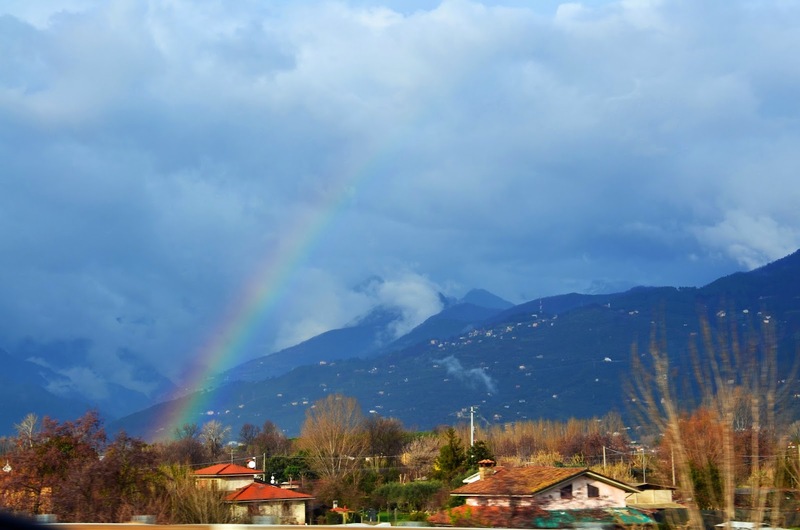 "Maybe it's a small world, maybe we're in a global economy, and maybe we are slowly melting into one pot, but everyday life is still radically peculiar in rural Italy. Cut a slice anywhere: it remains purely Italian. First, the getting there. Thanks to a friend of my brother, we were able to fly standby in order to have much cheaper tickets (and well, really to be able to afford the trip all together). At first, I wasn't real thrilled of the idea of standby. What if we are waiting days to get there? Or come home for that matter? But honestly, when I was kicked back in my "bed chair" in First Class, listening to my ipod in my comfortable American Airlines slippers while being fed a five course meal, I wasn't complaining. I also didn't mind that we were able to stop a few extra days in London, England and see a little bit of another country I had never been to on the way. I learned several things in London. I learned that you shouldn't call them "french fries", that you shouldn't even bother seeing what is on the tube (it's probably going to be perverted), and you should never, EVER, under any circumstances stay at a place called the Yotel. Imagine if you will, the smallest closet in your house. Now image it is filled with a bed, shower and toilet. That is the Yotel. They designed this hotel to look like a space station and our room was nothing short of a space pod. Needless to say, we had a good -laugh until you cry- moment in that place and it will always be something we remember. But enough about that - on to Italy. Milan welcomed us with open arms. 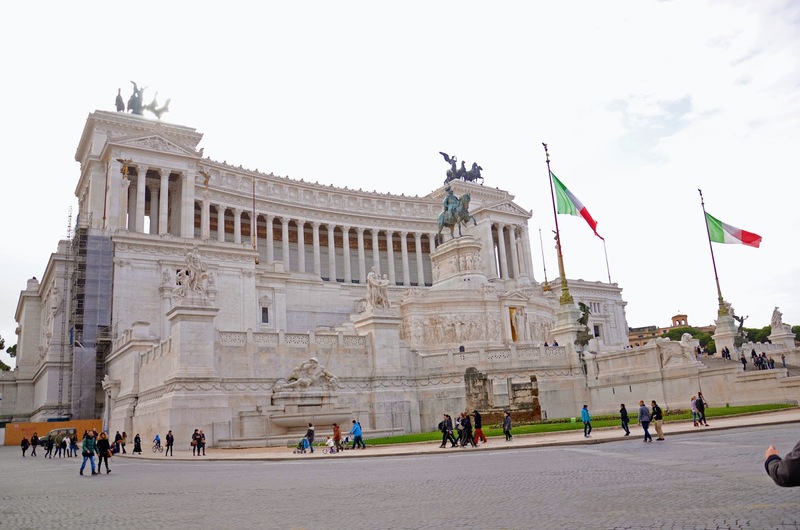 I've always wondered ... since I was a little girl, but more so since we decided that we were really going to take this trip, what it would feel like the moment I stepped on Italian soil for the very first time. My brother joked with me that I "better not cry", but I knew it was inevitable... I would get emotional. And I did. There were several times in the trip, in fact, when I felt overwhelmed with fascination and joy and love and I let myself get emotional. This trip wasn't just about seeing. It wasn't about taking photos so that I can one day remember and it wasn't about being able to just say we went. It was about feeling that place. It was very much about the emotion I knew I would experience when I heard phrases I've heard my mother and grandmother say my entire life. When I saw places I've only seen pictures of for years. When I would make friends with a complete stranger and know she would somehow become a lifelong friend. Milan was beautiful. It wasn't nearly as cold over there as it is here now, and for that I was grateful. When we first got off of the plane and headed into the airport to get our luggage, I couldn't believe my ears. It was the first time in my life I had ever been surrounded by so many people speaking without a word of English. It scared me at first, but fortunately, my brother and I had both learned just enough Italian to get us through our trip. Even in the areas like Peschici and San Pietro where not a soul spoke English. Most of the Italian I knew had to do with eating. Ha. Surprise, right?! I saw bags and shirts while over there that said "Eatily" on them, and since I also love to eat, I figured I was right at home. 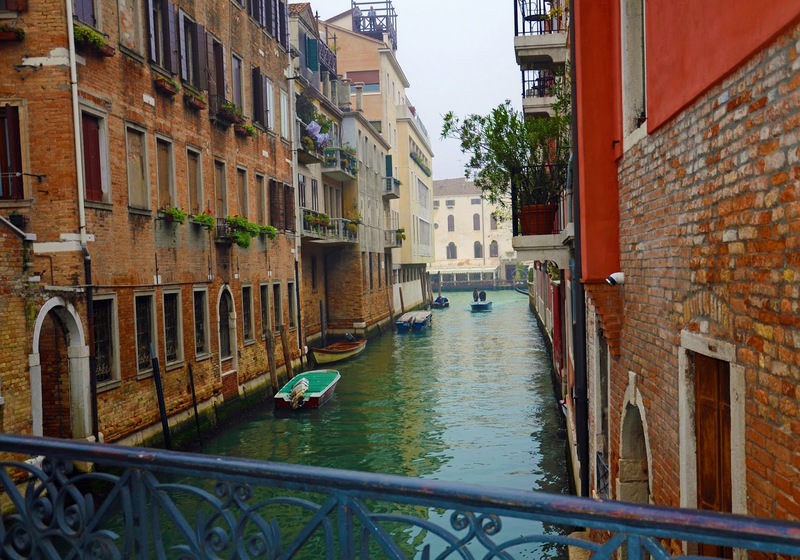 Venice was such an entrancing place. As we drove across the bridge to get there, I wasn't sure what to expect. It was a little foggy and getting close to night, so I really didn't even get a chance to see all of it's amusements until the next day. We found our place to stay on AirBnB, which is a website where people rent out their apartments. Fortunately, we found our place through a man named Alvise` (pronounced Al-vee-say) who was incredibly nice and generous. It was a gorgeous flat. On one side, looking out of our kitchen window you could see other apartment terraces with plants and flowers -and sometimes clothes- out on them and a beautiful courtyard down below. On the other side, Laguna Veneta or the Venetian Lagoon, the enclosed bay of the Adriatic Sea. The next day when we woke up in Venice we decided to just "get lost". Of course, before you get into Venice you have to leave your cars and either walk over the bridges down into the city or take the water bus, because everyone travels by foot in Venice. So when we headed out that second day, we took off on foot, exploring, with no map or plans - just wanting to get lost and blend into our surroundings. Everything is lit up at night, lights are everywhere and it is absolutely gorgeous. People will be on the street with a guitar or trumpet or whatever just playing music and singing Italian songs. The courtyards or "squares" feel like something out of a movie. I could sit on the benches and watch people and pigeons (just ask my brother!) for hours. "But come back in November or December, in February or March, when the fog, la nebbia, settles upon the city like a marvelous monster, and you will have little trouble believing that things can appear and disappear in this labyrinthine city, or that time here could easily slip in its sprockets and take you, willingly or unwillingly, back." --Erica Jong, "A City of Love and Death: Venice"
As we drove down the east coast of Italy, I truly saw the magnificence of God. Beauty was everywhere we turned. On one side, the green fields I didn't expect to see in the winter time and behind them, extraordinary mountains. On the other side, the coast - shore and waves of the Adriatic Sea. As we neared our destination, I could see a city on a hill, overlooking the water - and according to google maps, we were staying at the tiniest tip of it. It looked exactly like the postcards I have always seen of Italy. While in Peschici, we decided to venture down to the beach and spend part of the day there. I'm so glad we did. We took our shoes off and dipped our feet into the sea. We gathered stones and seashells and threw a few into the water for my grandmother, wishing she were there with us. And yet, I know she was. After leaving Peschici, we rode a ferry over to Sicily from Calabria. 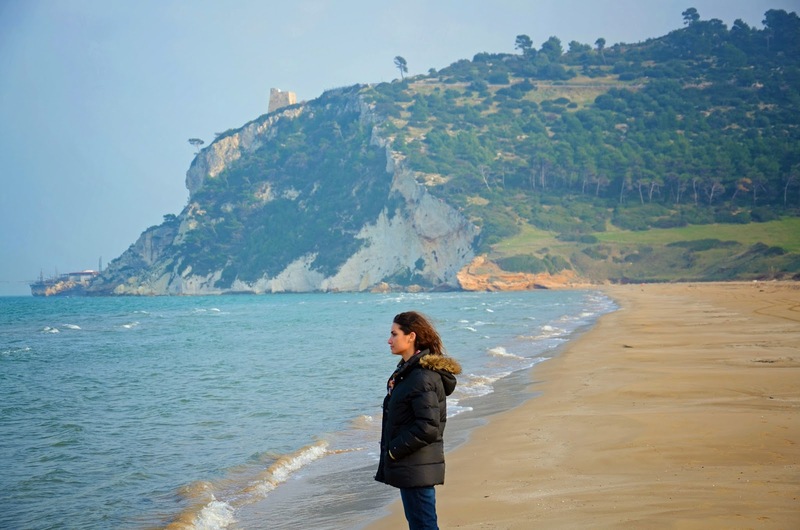 I have several friends who have gotten to travel to Italy, but none so far that were able to make it to Sicily, so I was eager to see what it was like all of these years after my mother visited. 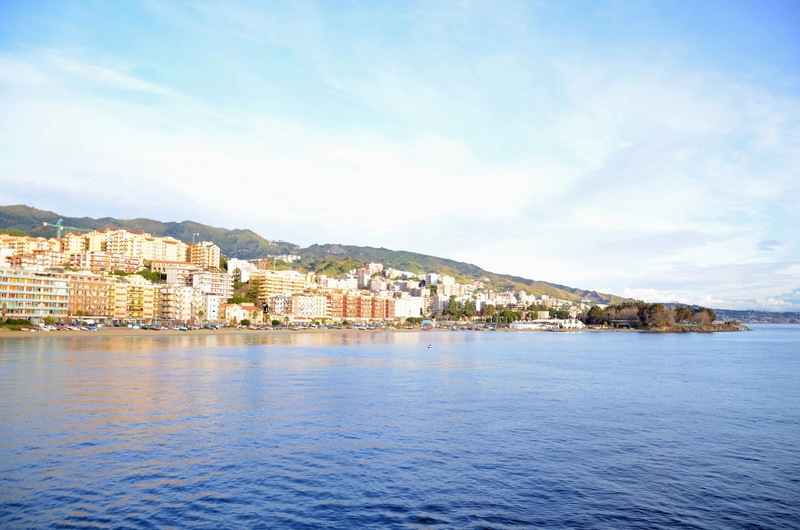 "Discover Sicily and you discover the world." I am so thankful for Roberta, the woman we met through AirBnB in Palermo, Sicily. Not only because she was our "tour guide" while we were there and informed us about so many different things - culture, architecture, food... but because she and I hit it off, right off the bat and instantly became friends. She is as good as gold and I can't wait to spend more time with her, whether I visit her or she visits us here in America. Whenever I seemed eager to explore, try new things, talk to the locals - she would say "I just love you! You're my new best friend." She was so much fun. One of the things she told us about Sicilians is that they don't eat to live, they live to eat. Which, wasn't really a huge surprise to us, considering our great grandmother was from Palermo- making us Sicilian. At our home growing up (and even now) for Holiday meals my mother, aunt and grandmother cooked enough food to feed an army. Roberta told us that we just had to try all of these different delicious foods and took us by several places in order to give us a taste of Sicily. First, we went to breakfast where I asked for an American Coffee, and was given a tiny milk chocolate bar to go with it. Because I wasn't sure why, I asked Roberta. "Don't you Americans do that? Stir chocolate in your coffee?" If we do, I've never heard of it, but it sure was delicious. Next, she took us to try these sweet breads (kind of like a donut but not as sweet) stuffed with things. I tried one with prosciutto e mozzarella which was delicious. My brother had one with zucchini that also looked really good. Then we had Italian Gelato and yes - this was all before lunch! ha. Roberta took us around the town to see the sites - the opera house, the square of shame, the 4 corners, many beautiful churches and so much more. As we were just walking through the city exploring, I saw a woman on about the third floor of an apartment lower a bucket on a rope down to a man below. As we got closer, I saw the man reach in and pull a plate filled with spaghetti out of the bucket and she brought it back up. I thought that was just the greatest. Again, everything I expected out of Italy. We learned so much more about Sicily thanks to Roberta. How the Mafia was alive and well. How the Sicilians live - moment to moment. They take their lunch breaks and gather in the park, usually with gelato, and listen to the orchestra coming from the building across the street. She said there is an expression in Palermo about the hands on a watch winding down. Basically, it means that time is never guaranteed to us, and we must live each day to the fullest. They absolutely do. It has the city feel, with lots of shops and parks and fun little restaurants but it is surrounded by mountains and coast which almost makes it feel like you are on a movie set. The people are so welcoming and warm. Everywhere we went, people treated us like we were special guests. In fact, in one little deli we went into, the owner wanted to take a photo with "the Americans" so he could hang it on his wall in his place. NOT the drivers. The driving was crazy! Absolutely crazy. I've always heard that Rome is the worst, but not even close. The lines on the road over there are just suggestions. Everyone is getting where they need to go as if they are the only ones on the road. When we first got into Sicily, we saw a man whose entire front of his car was on fire! Now I realize - that was symbolic. Next, we traveled to Herculaneum (or Ercolano) & Pompeii. Herculaneum and Pompeii were both destroyed by a Mt. Vesuvius eruption in AD 79. 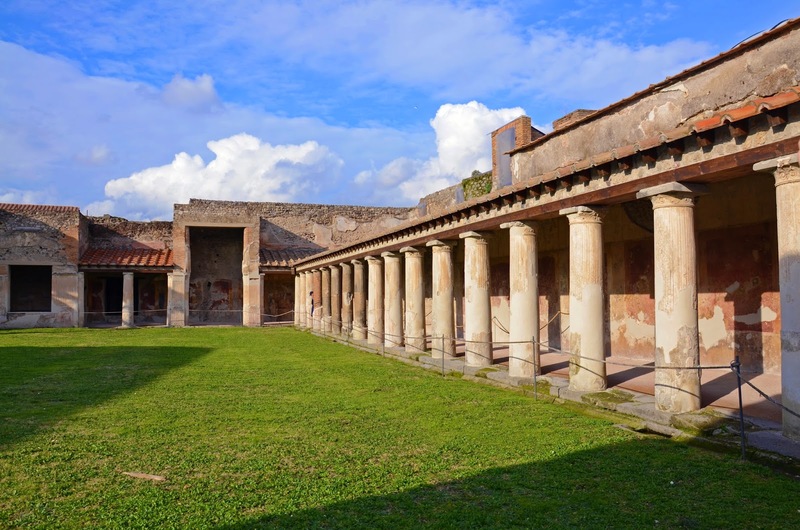 After the eruption, the town of Herculaneum was buried under approximately 50–60 feet of ash. It lay hidden and largely intact until discoveries from wells and underground tunnels became gradually more widely known. Excavations have continued up to the present and today many streets and buildings are visible, although over 75% of the town remains buried. Pompeii was absolutely amazing. 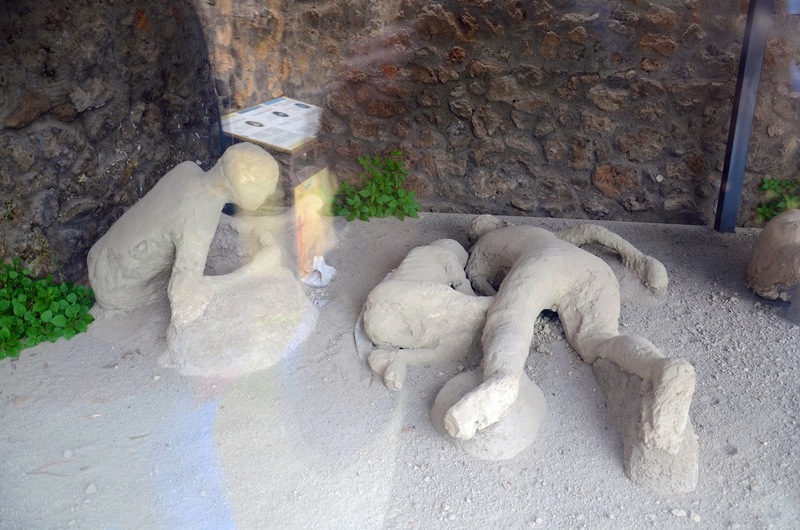 Though the ceilings and floors of the buildings and homes there were not nearly as preserved as in Herculaneum, there were actual plaster casts of the victims. The larger ones, our tour guide told us were most likely slaves, because people in Pompeii back then were all very small. He also told us about the huge stones across the roads. They were there in order for people to get across because the sewer used to just run down the streets. 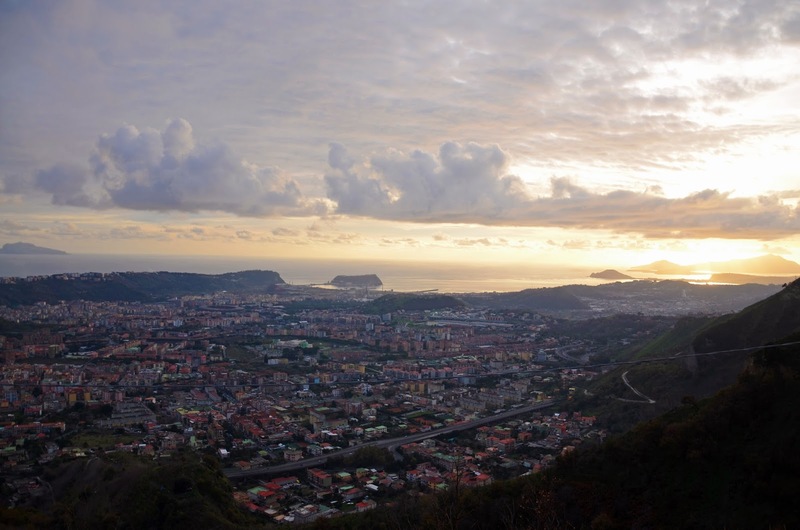 Naples had the most amazing view, and the kindest family owned hotel staff. I loved our stay in Naples. 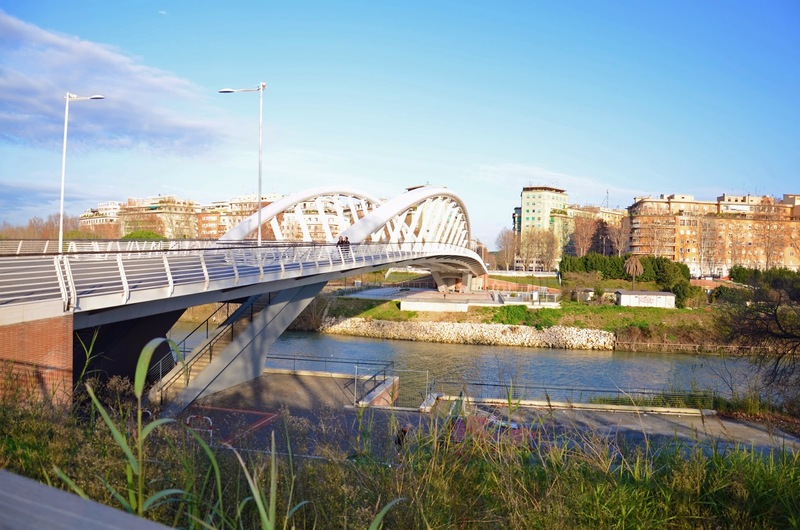 It wasn't too close to the city, and we were so close to the surrounding cities that we were able to take our time and see important things that we had planned to see. While in Naples we made a friend, Antonio, who was so very friendly and helped us with anything we needed. He made the best cappuccinos and one night his mother cooked a meal for us. We really didn't know what to expect. They brought us out a plate of prosciutto, mozzarella and different olives. So we thought, ok, this is nice. Ha. 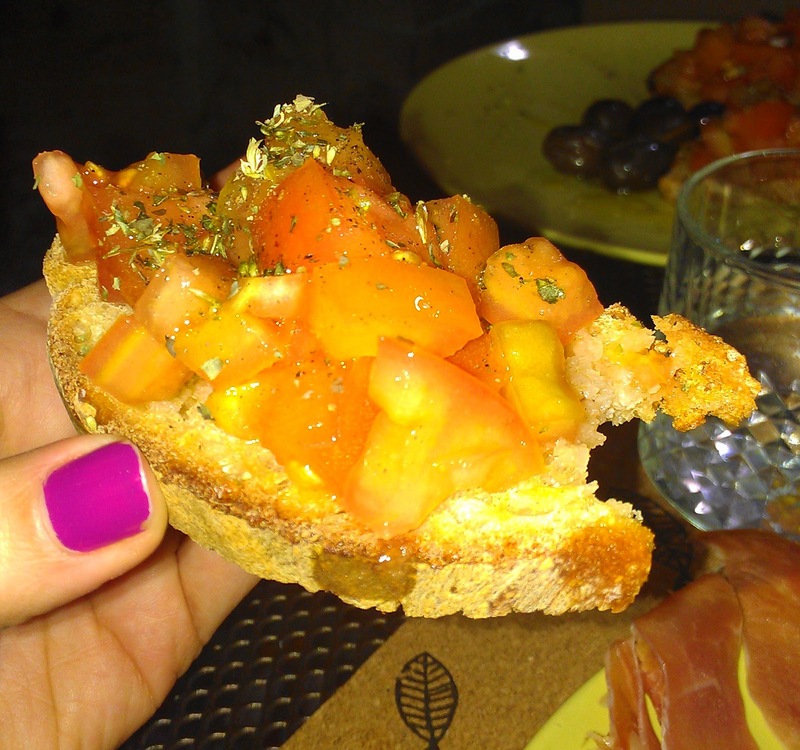 But then, they brought out a plate of the most delicious bruschetta (see, I told you I love to eat! ), followed by a pasta dish in white sauce, a salad, and followed with dessert which was an assortment of arancinis. By the end of that meal I felt like I was never going to eat again for the rest of my life. How they all stay so skinny, I have no idea. But they do. In fact, I saw a few "chubby" people while over there, but I never once saw an obese person. Anyway, it was some of the most delicious food and that night, we got to eat it by a roaring fire. It was lovely. We also saw a firework show over the city one night. Unfortunately, I didn't take any photos of that because I was just standing in awe. 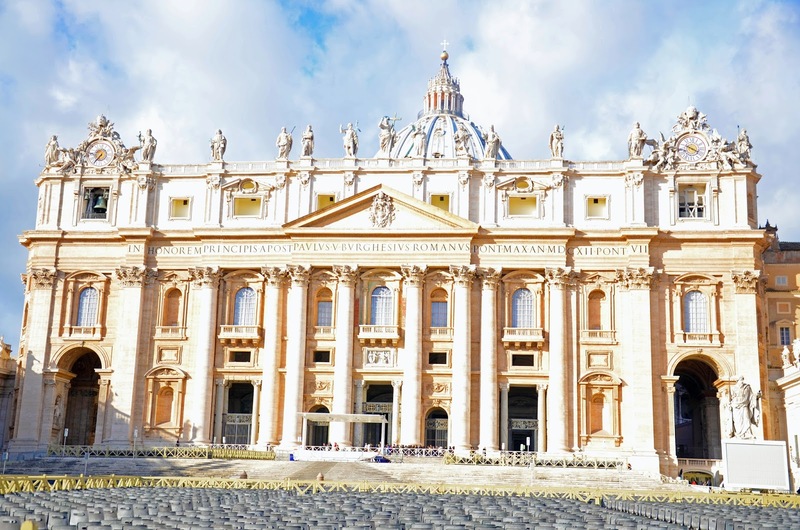 In San Pietro, we were able to see the very ground we have always heard my Papaw talk about. My dad's dad was in World War II in the 36th Infantry Division. 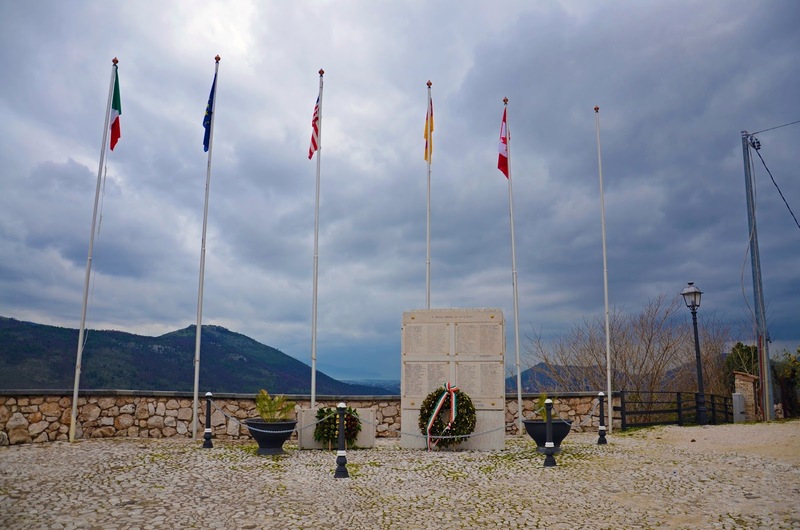 He fought in the battle of San Pietro in December of 1943 to help liberate the Italians from the Germans. There was a monument there, honoring those men who had fought in that battle. Along with a museum. When we pulled up, there was a man there at the monument, all by himself. As we began talking to him, he told us that his sister had been killed there in that battle. We told him that our grandfather was a part of the 36th and he was a very grateful man. 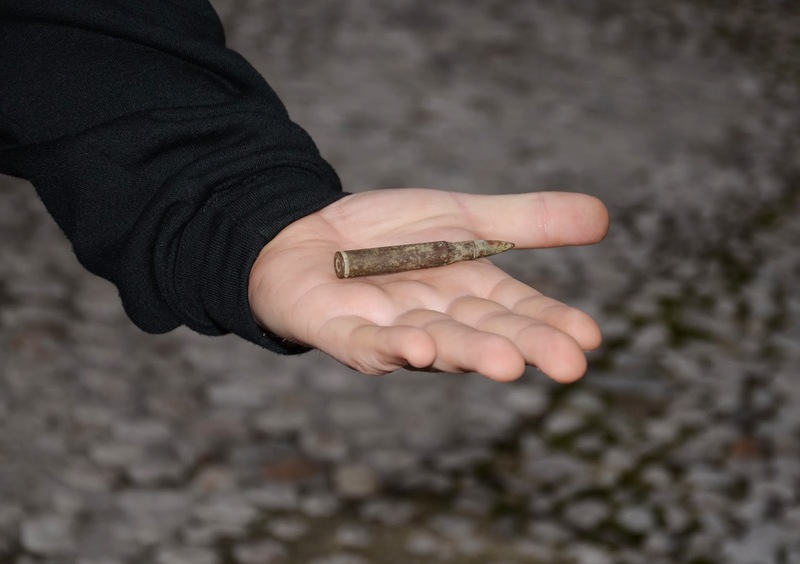 When he saw us picking up rocks for a souvenir to take back to my dad, he told us to hold on just a moment and he went to his car and brought back a bullet and shell casing. As he handed it to us, he said in broken English and holding back the tears - " It is important for us to remember history. I am thankful to all of the Americans." We all hugged and became emotional, remembering that my Papaw thought of this battle often before he died in 2002. And that brings us to the beautiful City of the Seven Hills, Roma. 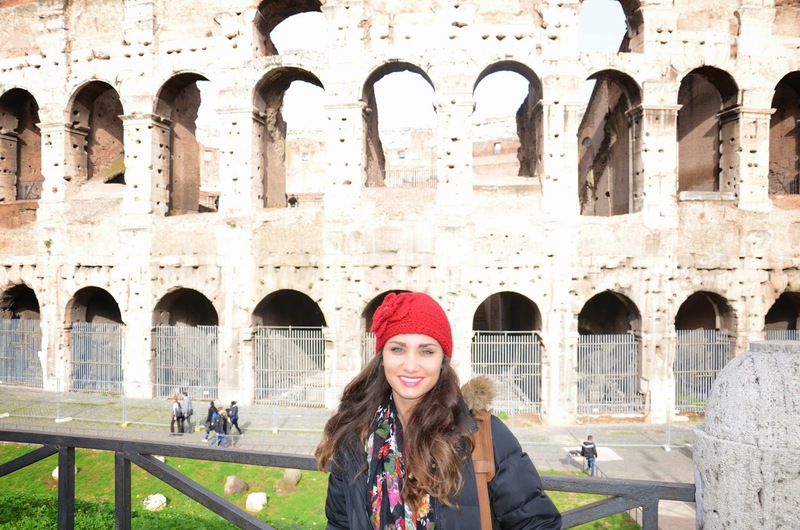 Walking around in Rome was like being in a really good dream. There was so much beauty and history to see. It was almost like taking a look into the past. 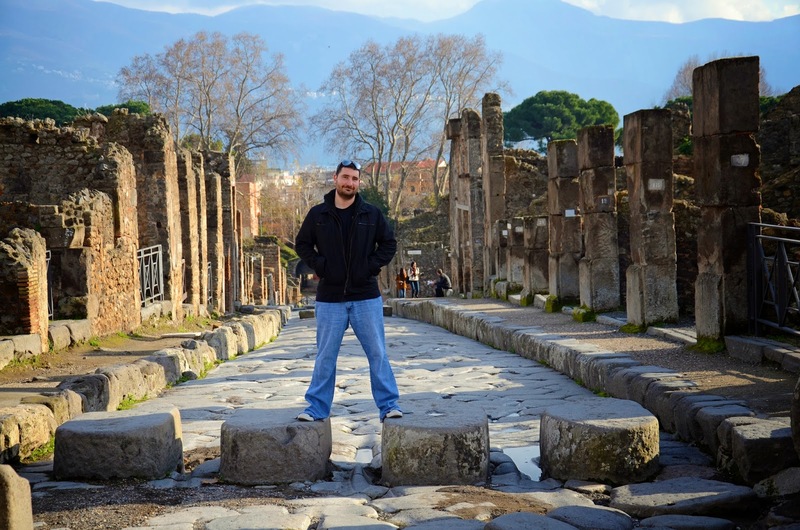 The first day in Rome we went to the Appian Way or Via Appia Antica. We walked down the road for a while, just to walk where Peter and Paul have stepped. We drove the rest of the way but had to cut that short due to rain. 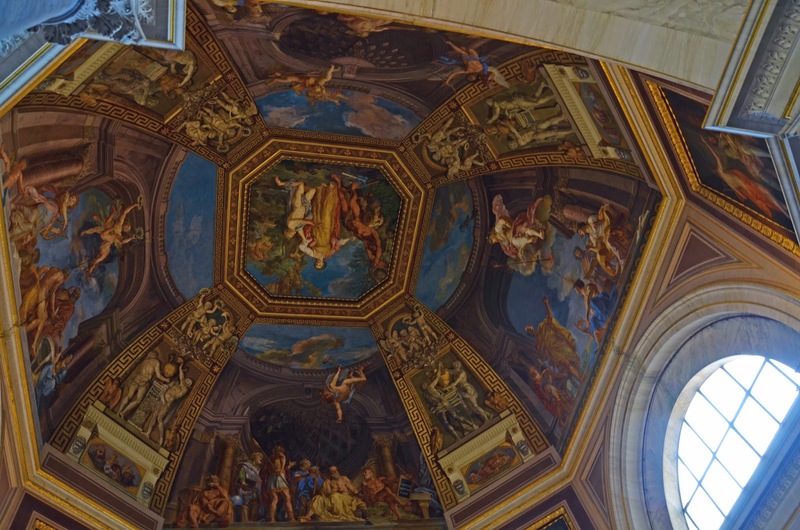 The next day we went to Vatican City and saw the Sistine Chapel and St. Peter's Bascilica. They were both absolutely breathtaking. 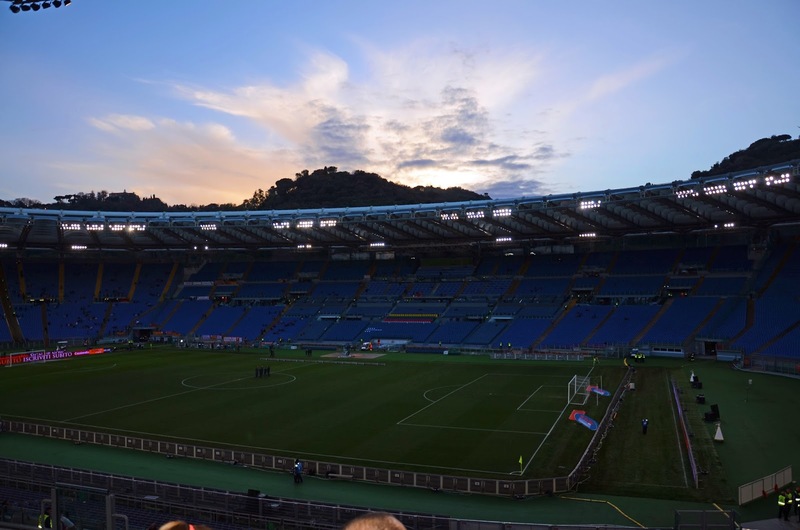 Then, we went to a soccer game in Stadio Olimpico - AS Roma vs. Livorno, where I was able to watch two of my favorite national players play. 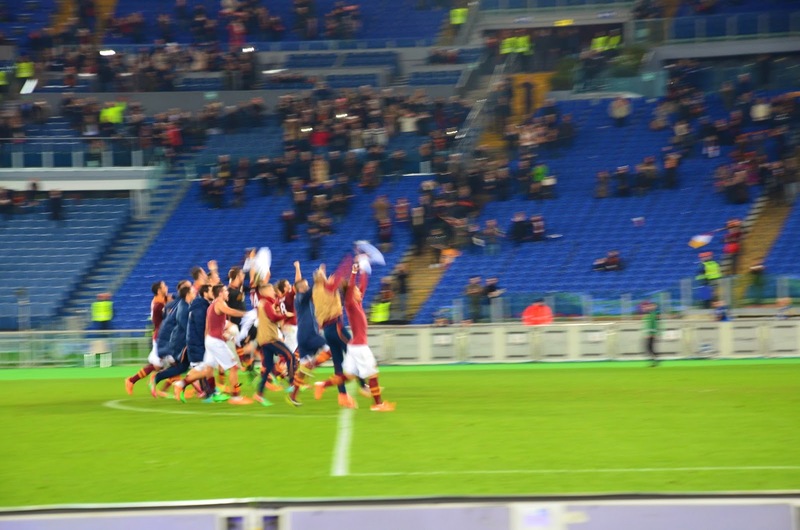 Grazie Roma! "to the best trip ever, may we make it back someday." The place we stayed was on a hill overlooking the Tiber River. Luckily we were just a walk away from some pretty incredible restaurants where we were able to try new things and one of the best things I ate while in Rome was Spinach Risotto. Ahhh... so good. I will definitely have to learn how to make that. After leaving Rome, we headed back toward Milan because we would fly out the next day. It was our last full day in Italy. I could hardly believe it. In a way, it seemed like a lifetime, but in another way it felt like it went by entirely too fast. On our way to Milan we decided to see a couple more places. 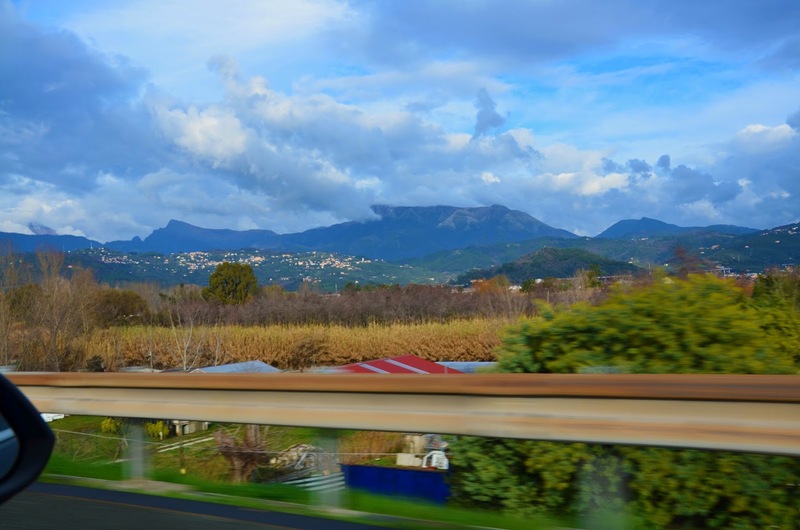 Unfortunately, we only got to drive through Tuscany and vowed to one day come back to spend more time there, in Florence, looking at the medieval castles and gorgeous vineyards. We did, however, get to stop in Pisa. 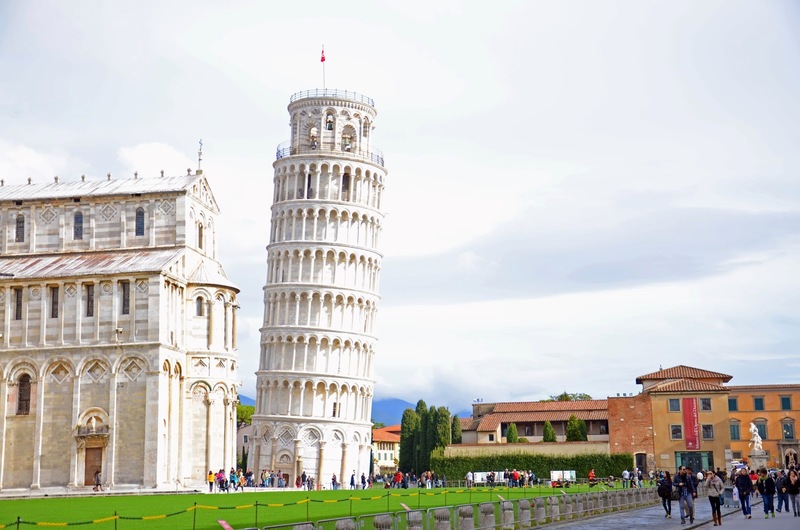 The Leaning Tower was something we definitely didn't want to miss. So that's it. That is the best I can describe this life changing trip with photos and words. I loved getting to see where my family is from, where my grandfather fought and this place I have dreamed about going all of my life. Even more than that, though, I loved getting to spend the quality time with my brother. You see, my brother and I are best buds. We always have been. It is very rare that siblings get to take a trip like this together, especially after one or both of them are married with a family. I enjoyed the time I got to spend with my brother. Whether silent and taking it all in, or the sometimes 10 hour rides in the car - listening to music, talking about the past and what we hope our futures some day look like. I love my brother very much and though I one day want to take my husband and my kids to see the place I love, I can't imagine that exact trip at that exact time with anyone other than him. "You may have the universe, if I may have Italy."